Albertans woke to clear skies on Monday after more than 10 to 20 centimetres of snow covered many parts of the province Sunday night, with reports of multiple crashes and reminders to stay safe on the roads. 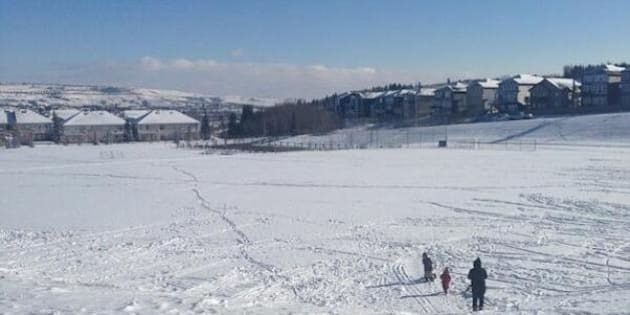 The Kananaskis and Bow Valley area saw upto 20 centimetres of snow, while parts of Calgary saw more than 10 centimeters, according to the Weather Network. Edmonton received a thin dusting of snow, with a heavier snowfall expected on the coming weekend, CTV Edmonton reports. Crews were out all night in Calgary getting roads ready for the Monday morning rush hour. According to 660News, there were about 150 crashes reported in Calgary on Sunday. The weather was partly blamed for a fatal collision between a truck and highway equipment, that killed two along Highway 27 on Sunday. RCMP reminded drivers to use extra caution while on the roads, but not everyone seemed to be listening. "Worst snow driver of this young day: guy on his phone who only removed snow from half of windshield, driving on icy suburb road," said Zoey Duncan on Twitter. "Put down your Tim's & put your eyes on the road!" added Ellie Z, also on Twitter. The weather is expected to heat up by Halloween as warmer air moves in by mid week, according to the Weather Network.